This is Aniol’s first book though it is the second I have read. The Foreword is written by Dr. Kevin Bauder, President of Central Seminary, Minneapolis, MN where Scott Aniol has taken graduate classes. Aniol also has a bachelor’s degree from BJU and a master’s degree in musicology from N. Illinois University. I appreciated his use of the term “Encyclopedic” to refer to those who won’t apply Scripture to modern problems; his reaffirmation that music is not morally neutral; that Luther and others did not use bar tunes, etc., for church music; and his referring to T.S. Eliot who first pointed out that culture is an incarnation of a people’s religious beliefs. 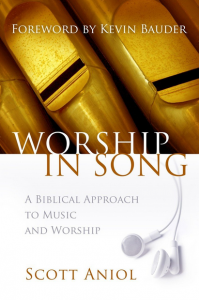 I only disagree with Aniol in blaming early American evangelists (Finney, Moody, Torrey, Sunday, Sankey, and Bliss, p. 73) for the introduction of popular means into evangelism which later resulted in the introduction of “pop” music into our churches. Perhaps some, surely not all.